Muay Thai, or Thai Boxing as it is also known, is an ancient Martial Art ingrained into the rich history of Thailand. Muay Thai has evolved over decades of fighting on the battlefield and utilises punches, elbow & knee strikes and kicks. For this reason, it is also known as “The Science of Eight Limbs”. Muay Thai is the National Sport of Thailand and over the last two decades has seen a massive surge in popularity world-wide. It is considered by most as the ultimate ‘stand-up fighting art’ and with the ever-growing popularity of Mixed Martial Arts Promotions (such as the UFC, BAMMA & Bellator) it is clear to see why. 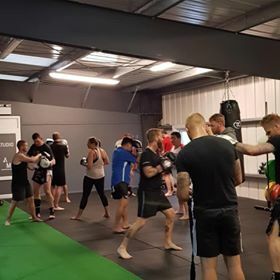 Training in Muay Thai doesn’t just have to be about competition; self-defence and unrivalled fitness are two of the main reasons for people taking Muay Thai classes. In fact, it is only a small percentage of people that choose to test their skills in competition with everyone else enjoying some of the best cardio and strength workouts you will find. So, who is Muay Thai for? The simple answer is anyone; young or old, with any level of fitness. We run kids classes, beginner classes and advanced classes and are able to adapt sessions to suit everyone. What can you expect from a Muay Thai class? 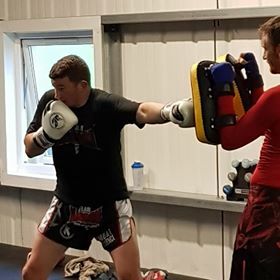 Each session is a careful combination of circuit work and flexibility exercises before partner drill work using gloves and ‘Thai-pads’ to practice punches, elbows, knees and kicks. Each session is an hour long and ends with a cool-down and stretching exercises. The classes are fast, dynamic, hard but fun and are guaranteed to leave you feeling like you have had, not only the best work out but, a whole lot of fun at the same time! Our Thai Boxing classes are friendly, and everyone is welcome so don’t worry about coming along and giving it a try. Who takes the classes? We are lucky enough to have the World-Famous Team Kaobon at our gym. Team Kaobon is based in Liverpool and has been producing top level fighters for decades. Most recently it has gained world-wide fame due to UFC Fighter Darren Till, under Head Coach and Founder Colin Heron. 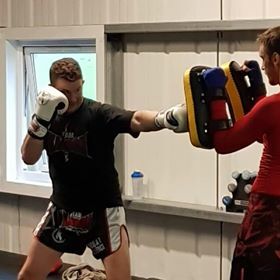 The classes at Athlete Movement are run by Seb Jones, who has been teaching Thai Boxing for Team Kaobon in and around London, Surrey, Berkshire and Hampshire since 2000. Whether you want to become the next World Champion, get fit or learn something new then Thai Boxing is for you. Give it a try; we know you’ll love it.